The DCS7485T1 60-Volt MAX 8-1/4 in. table saw is maximized for accuracy, capacity and runtime. The brushless motor delivers the power to cut all common materials, the rack and pinion fence allows for fast, easy adjustments and provides the capacity to rip 4x8 sheet goods. The DCS7485T1 comes with 1 60-Volt MAX lithium-Ion battery and fast charger. For a limited time get a bonus FLEXVOLT 20-Volt/60-Volt MAX lithium-Ion Battery Pack (9.0Ah) with purchase. 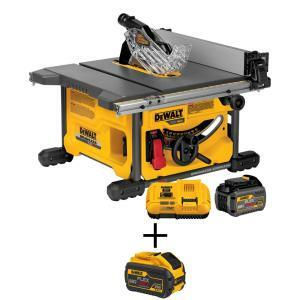 Tbook.com crawls the web to find the best prices and availability on Table Saws and related Tools and Hardware products like Dewalt FLEXVOLT 60-Volt MAX Lithium-Ion Cordless Brushless 8-1/4 inch Table Saw Kit with Battery 2Ah, Charger.... For this page, related items include products we find that match the following keywords: "Table Saw" at our vendor partner Home Depot. Dewalt FLEXVOLT 60-Volt MAX Lithium-Ion Cordless Brushless 8-1/4 inch Table Saw Kit with Battery 2Ah, Charger... is one of 60 Table Saws and related products listed in the Tools and Hardware section of Tbook.com If you have any questions on this product, please give us a call at 734-971-1210 during the hours of 9am - 5pm EST for assistance. Thank you for shopping at Tbook.com, the Internet Department Store!